Hurry, this offer is only available to purchase between 15 January - 31 January 2019. - This is an online offer only. - You must be a valid Cinebuzz member to access offer. Not a Cinebuzz member? JOIN HERE. 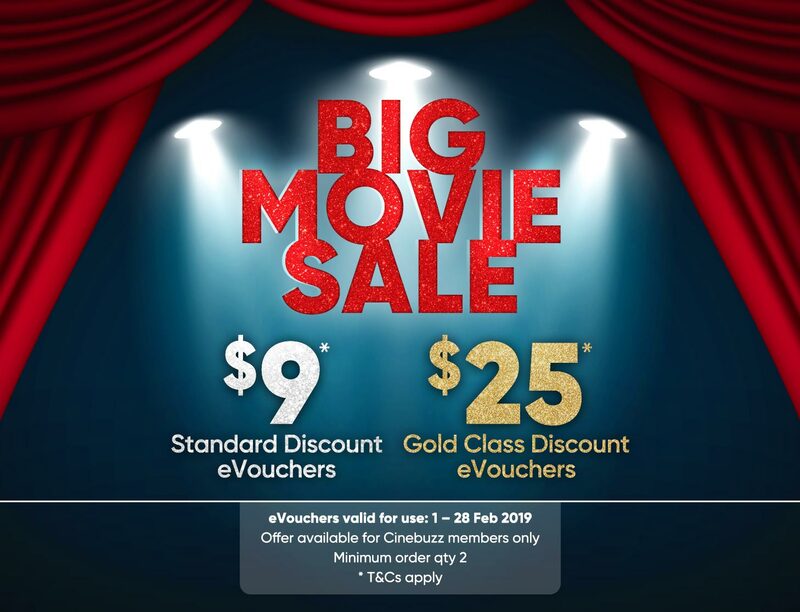 These discount eVouchers are only valid for use between 01 February 2019 - 28 February 2019. Not valid for advance ticket sales after 28th February 2019. Each unique barcode can be redeemed for one standard admission to any standard session at Event Cinemas, BCC, GU Film House & Greater Union locations. The onus is on the holder to use the eVoucher on or before the specified expiry date. After this period the barcode becomes void and cannot be used. This eVoucher does not guarantee a seat - seating is subject to availability. 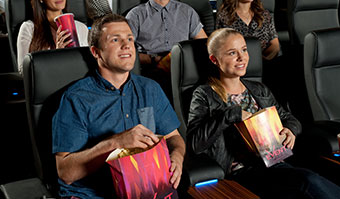 Book your seats online at www.eventcinemas.com.au (booking fees apply) or take a printed copy of the emailed eVoucher to, or display emailed eVoucher on your smartphone at cinema box office. This eVoucher is not available for use at Skyline Drive In, Moonlight or Village Cinemas. Not valid for 4DX, premium concept seating, Gold Class, Movie Marathons, group bookings, Chicks at the flicks or any sessions classified as festivals, alternate content or special events including but not limited to foreign films. Surcharges apply to upgrade the cinema experience to Vmax and 3D and must be paid at the same time as redeeming the eVoucher. Glasses sold separately. Not valid with any other promotion or offer. The Greater Union Organisation Pty Ltd (GUO) takes no responsibility for the information entered by the purchaser or for incorrect details such as email address, by the purchaser. eVouchers are sold with the understanding that they will not be replaced or exchanged. No refunds given except those required by law. No date extensions available. No change will be given if the session is of lesser value. This eVoucher cannot be transferred or sold without the prior written permission of GUO. Any use of the company name, images or logos must have the prior written consent of GUO. Standard classifications apply. Valid for use in Australia only. eVouchers will be void and will not be redeemable if they are defaced, mutilated, altered or tampered with in any way, or if the eVoucher Barcode is illegible. GUO may subject eVouchers to verification and security checks in its absolute discretion. GUO reserves the right to cancel any eVoucher purchased or on sold fraudulently. A maximum of 10 eVouchers can be purchased per transaction. Offer available for sale for a limited time only. This eVoucher is strictly valid to use between 01 February 2019 - 28 February 2019. 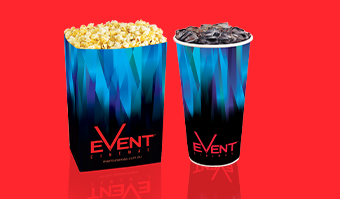 $5 Popcorn or Drink eVoucher entitles the holder to one medium popcorn serving or one medium drink. Valid for a medium popcorn or drink only, cannot be used for alternative food or beverage items. Additional items must be paid for separately and are the responsibility of the purchaser. This eVoucher is only valid for use at Event Cinemas, GU Film House or BCC candy bar or Scoop Alley locations. Not valid at Skyline Drive In, Moonlight Cinema or Village Cinemas. Take a printed copy of the emailed admission eVoucher to, or display emailed eVoucher on your smartphone at, the Candy Bar. Vouchers are sold with the understanding that they will not be replaced or exchanged and are invalid without an expiry date. No refunds given except those required by law. No date extensions available. No change given. The onus is on the holder to use the voucher before the specified expiry date. Vouchers cannot be transferred or sold without the prior written permission of The Greater Union Organisation Pty Limited (GUO). Any advertisement, circulation or publication, which includes a reference to Event, BCC, GU Film House and Greater Union Cinemas by you or one of your customers, must first be approved in writing by GUO. Cannot be used in conjunction with any other special offer or promotion. Valid for use in Australia only. Vouchers will be void and will not be redeemable if they are defaced, mutilated, altered or tampered with in anyway, or if the Voucher Barcode is illegible. GUO may subject eVouchers to verification and security checks in its absolute discretion. GUO reserves the right to cancel any eVoucher purchased or on sold fraudulently. A maximum of 20 eVouchers can be purchased per transaction. Offer available for sale for a limited time only. 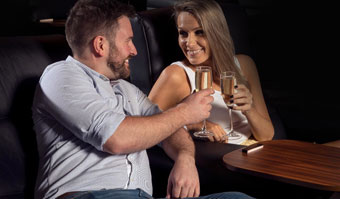 These discount Gold Class Off Peak eVouchers are only valid for use between 01 February 2019 - 28 February Not valid for advance ticket sales after 28 February 2019. Each unique barcode can be redeemed for one standard Gold Class session at Event Cinemas Gold Class locations. Surcharge applies for sessions from 5pm Friday & Saturday nights. The onus is on the holder to use the eVoucher on or before the specified expiry date. After this period the barcode becomes void and cannot be used. This eVoucher does not guarantee a seat - seating is subject to availability. Book your seats online at www.eventcinemas.com.au (booking fees apply) or take a printed copy of the emailed eVoucher to, or display emailed eVoucher on your smartphone at cinema box office. Not valid for use on Valentines Day (SPECIAL EVENT) 14.02.2019 for sessions after 5pm. This eVoucher is not available for use at Skyline Drive In, Moonlight or Village Cinemas. Not valid for 4DX, premium concept seating, Movie Marathons, group bookings, Chicks At The Flicks or any sessions classified as festivals, alternate content or special events including but not limited to foreign films. Surcharges apply to upgrade to 3D and must be paid at the same time as redeeming the eVoucher. Glasses sold separately. Not valid with any other promotion or offer. The Greater Union Organisation Pty Ltd (GUO) takes no responsibility for the information entered by the purchaser or for incorrect details such as email address, by the purchaser. eVouchers are sold with the understanding that they will not be replaced or exchanged. No refunds given except those required by law. No date extensions available. This eVoucher cannot be transferred or sold without the prior written permission of GUO. Any use of the company name, images or logos must have the prior written consent of GUO. Standard classifications apply. Valid for use in Australia only. eVouchers will be void and will not be redeemable if they are defaced, mutilated, altered or tampered with in any way, or if the eVoucher Barcode is illegible. GUO may subject eVouchers to verification and security checks in its absolute discretion. GUO reserves the right to cancel any eVoucher purchased or on sold fraudulently. A maximum of 10 eVouchers can be purchased per transaction. Offer available for sale for a limited time only. 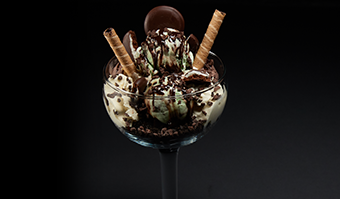 This eVoucher is strictly valid for use between 01 February 2019 - 28 February 2019 $20 Gold Class Cheeseburger Sliders or Mint Slice Sundae eVoucher entitles the holder to one serving of Gold Class Sliders & Fries or a Mint Slice Sundae. Valid only for Gold Class Cheeseburger Sliders or Mint Slice Sundae it cannot be used for alternative food or beverage items. Additional items must be paid for separately and are the responsibility of the purchaser. This eVoucher is only valid for use in Gold Class at Event Cinemas. Not valid for use from 5pm on Valentines Day 14.02.2019. Take a printed copy of the emailed admission eVoucher to, or display emailed eVoucher on your smartphone at, the Gold Class bar. Vouchers are sold with the understanding that they will not be replaced or exchanged and are invalid without an expiry date. No refunds given except those required by law. No date extensions available. No change given. The onus is on the holder to use the voucher before the specified expiry date. Vouchers cannot be transferred or sold without the prior written permission of The Greater Union Organisation Pty Limited (GUO). Any advertisement, circulation or publication, which includes a reference to Event, BCC, GU Film House and Greater Union Cinemas must first be approved in writing by the GUO. Cannot be used in conjunction with any other special offer or promotion. Valid for use in Australia only. Vouchers will be void and will not be redeemable if they are defaced, mutilated, altered or tampered with in anyway, or if the Voucher Barcode is illegible. GUO may subject gift vouchers to verification and security checks in its absolute discretion. GUO reserves the right to cancel any eVoucher purchased or on sold fraudulently. A maximum of 20 eVouchers can be purchased per transaction. Offer available for sale for a limited time only.